Need to jot down a reminder about the guest or booking? Want to flag the booking as having a problem? You can now do that directly on the booking. And anything you write down in the booking notes can be found in search. You can now set a specific check-in and check-out time on the booking, alerting your staff when a guest is arriving early or leaving late. 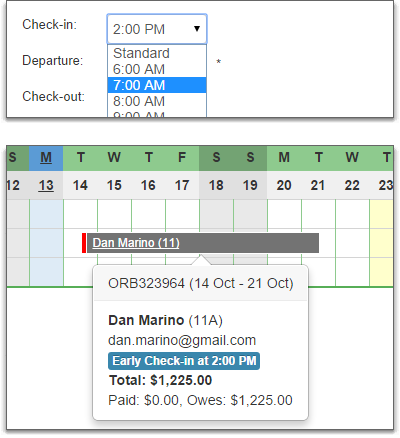 The booking ribbon and calendar views also show indicators so that you're reminded in the future. You can also create email templates for the early/late check-in/out time so that your guest gets a confirmation of the change. Your third party people (staff, housekeepers) will also receive a notification just as they do when the dates change. The major listing sites (FlipKey, VRBO) have been making it more and more difficult for you to see your guest's contact info when they send inquiries. We've tried addressing this by incrementally updating our inquiry parsing engine, but it's come time to think outside the box. We'll be making lots of changes to our inquiry response process over the next few months as we work to close the gap between the listing sites' policies and your need for central management. Where do I get this screen? There are three separate things here. The notes can be found on the booking. Open any booking and look for the Notes tab. Any notes entered will also display on the booking overview page. The early/late indicators can also be set on the booking. Open any booking and look for the Dates tab. 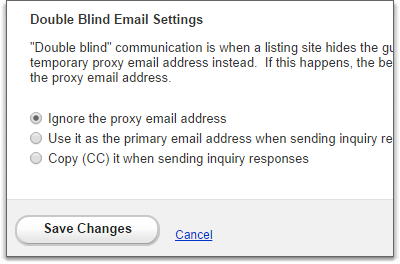 The Double Blind settings can be found in your linked accounts. Go to Settings > Linked Accounts and click to edit the settings for VRBO, HomeAway or FlipKey. You'll see the new settings at the bottom under the property match-up area.